In this article, I've decided to follow up on a topic I wrote about not in my column directly, but as a feature article called "PXE Magic" in the April 2008 issue. In that article, I talk about how to set up a PXE server from scratch, including how to install and configure DHCP and TFTP. Ultimately, I even provide a basic pxelinux configuration to get you started. Since then, PXE menus with pxelinux have become more sophisticated and graphical and could seem a bit intimidating if you are new to it. In this column, I explain how to piggyback off of the work the Debian and Ubuntu projects have done with their PXE configuration to make your own fancy PXE menu without much additional work. I know not everyone uses Debian or Ubuntu, so if you use a different distribution, hold off on the angry e-mail messages; you still can use the PXE configuration I'm showing here for your distro, provided it gives some basic examples of how to PXE boot its installer. Just use these steps as a launching off point and tweak the PXE config to work for you. If this is your first time configuring a PXE server, for the first step, I recommend following my steps in the "PXE Magic" article to install and configure DHCP and TFTP. Otherwise, if you have existing servers in place, just make sure that DHCP is configured to point to your TFTP server (if it's on the same machine, that's fine). And, if you already have any sort of pxelinux configuration in your tftpboot directory, I recommend that you back it up and move it out of the way—I'm going to assume that your entire /var/lib/tftpboot (or /tftpboot on some systems) directory is empty to start with. For the rest of this article, I reference /var/lib/tftpboot as the location to store your PXE configuration files, so if you use /tftpboot, adjust the commands accordingly. Both Debian and Ubuntu provide a nice all-in-one netboot configuration for each of their releases that makes it simple to PXE boot a particular release yourself. The file is called netboot.tar.gz and is located in a netboot directory along with the rest of the different install images. 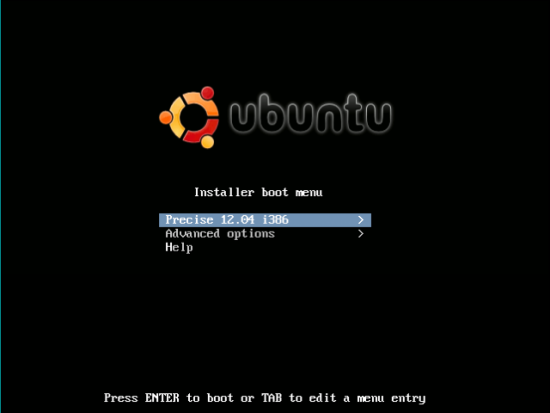 For instance, the netboot.tar.gz for the i386 Ubuntu 12.04 release (named Precise) can be found at http://us.archive.ubuntu.com/ubuntu/dists/precise/main/installer-i386/current/images/netboot/netboot.tar.gz. As the ls command shows, an ubuntu-installer directory was created along with pxelinux.0 and pxelinux.cfg symlinks that point inside that ubuntu-installer directory to the real files. Without performing any additional configuration, provided your DHCP and TFTP servers were functioning, you could PXE boot a server with this configuration and get a boot menu like the one shown in Figure 1. Ubuntu has taken the extra steps of theming its PXE menu with its color scheme and even provided a logo. Unlike the PXE menu I demoed in my previous "PXE Magic" article, this menu functions more like a GUI program. You can use the arrow keys to navigate it, the Enter key to select a menu item and the Tab key to edit a menu entry. If all you were interested in was PXE booting a single version of Ubuntu or Debian, you would be done. Of course, what if you wanted the choice of either the 32- or 64-bit versions of a particular release, or what if you wanted to choose between a few different releases? Although you could just overwrite your tftpboot directory every time you wanted to change it up, with only a few extra tweaks to the config, you easily can host multiple releases with the same menu. When you PXE boot now, you should see a menu option labeled Precise 12.04 i386, as shown in Figure 2. When you select that option and press Enter, you then can access the standard install options like before. The resulting PXE menu should look something like Figure 3. To add the 64-bit release, just adapt the steps from the above Precise 64-bit release to Quantal. Finally, if you want to mix and match Debian releases as well, the steps are just about the same, except you will need to track down the Debian netboot.tar.gz from its project mirrors and substitute precise for Debian project names like squeeze. Also, everywhere you see a search and replace that references ubuntu-installer, you will change that to debian-installer.